Junior Engineer and Mechanical Junior Engineer jobs of Punjab DWSSP. Candidates who are qualified Polytechnic Diploma/Degree in Civil/Electrical/Mechanical Engineering they are eligible to apply online for this Punjab Water Supply & Sanitation recruitment of Civil/Electrical/Mechanical Junior Engineer jobs. There are total 210 JE vacancies in this Punjab DWSSP Civil Junior Engineer and other JE jobs Recruitment 2018. A single stage written exam will be conducted for this Punjab Water Supply Dept vacancies recruitment of Civil Junior Engineer jobs. Mode of application is online. Apply online through www.govt.thapar.edu website form 16-06-2018 to 11-07-2018. 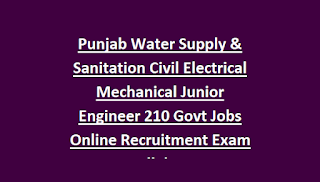 More information about this Punjab Water Supply & Sanitation Civil/Electrical/Mechanical Junior Engineer jobs exam pattern and Exam syllabus, number of vacancies, online applications process and more info is given below. 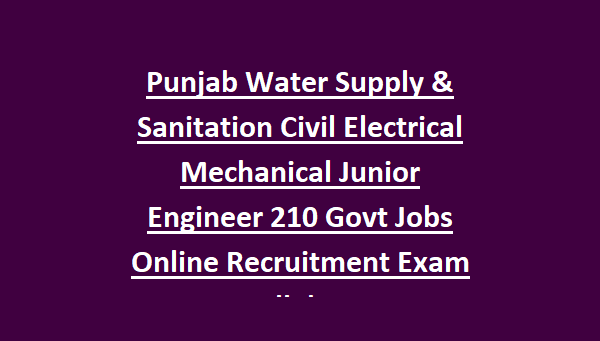 There are total 210 posts in this Punjab Water Supply Civil/Electrical/Mechanical Junior Engineer recruitment 2018. For category wise vacancies refer official notification. As on 01-01-2018 For general candidates 18-37 years and for reserved candidates 18-42 years. For PH Candidates 18-47 years and of Ex Serviceman as per norms. Selected candidates will receive monthly salary of Rs.9300-34800/- Grade pay is varying for each post. Selection for these Punjab Water Supply Dept vacancies will be through written exam only. Total 100 multiple choice questions will be given. Each questions carries one mark. Exam paper duration is 2 hours. Polytechnic Civil Engineering or Mechanical Engineering or Electrical engineering qualified candidates can apply online for this Punjab DWSSP jobs on or before 08-05-2018. Online applications will be accepted through www.govt.thapar.edu website.